My Dad, Julius Anthony Astore, was a child of the Great Depression. Born in 1917, he had to quit high school in 1933 to help support his family. In 1935 he joined the Civilian Conservation Corps, or CCC, working in forestry and as a firefighter in Oregon until he left in 1937. Finding a job after he left the CCC was tough, but eventually Dad got one working at F.B. Washburn’s Candy Company during the Christmas rush. I was hired for a five week job starting at 6:00PM and my night shift would be over 6:00AM the next morning. I would have Saturdays and Sundays off. My work hours would add up to sixty hours a week and I would get twenty cents an hour. Total twelve dollars a week. Those days there wasn’t any time-and-a-half after forty hours. It was quite a grind. I had to sugar hard candy that was shaped like a small peach stone. I won’t go into detail but it was a very tiring job. From my life’s experience I’ve found that the harder I worked physically the less money I made. Time goes by and I thought I was going to be laid off at the end of five weeks [but] I was put to work on the day shift permanently. That was in 1938, four years before I was drafted into the Army and introduced to World War II. When Dad was drafted into the Army in February 1942, he took a major cut in salary. 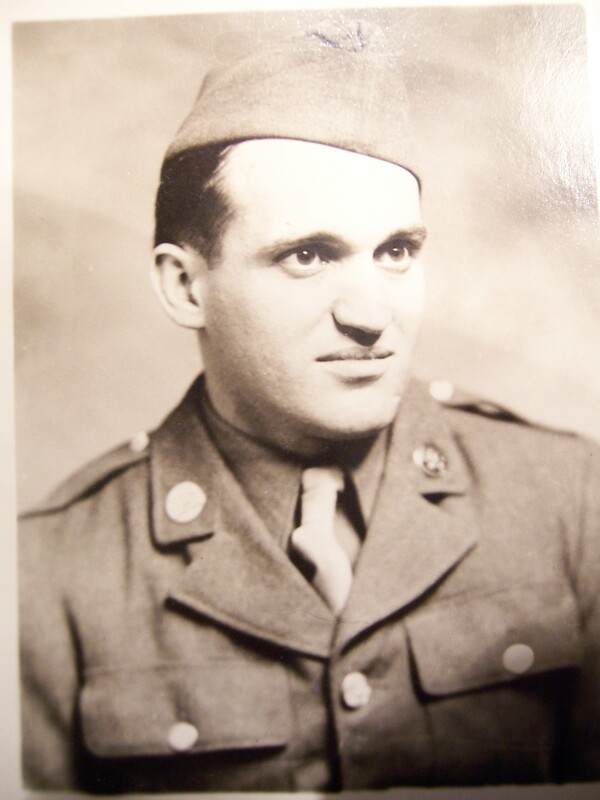 From making roughly $70 a month at Washburn’s Candy Factory, his salary dropped to $21 a month as an Army private (which was still $9 less than what he had earned in the CCC in 1935!). When he was discharged from the Army in January 1946 as a corporal technician, he was finally making what he had earned at Washburn’s, about $69 a month. Although it’s true that the American soldier was paid better than his British counterpart, it’s still shocking to hear that U.S. privates were fighting and dying in Europe and the Pacific for less than $30 a month basic pay. The truth is simply this: Even the richest, most prosperous country in the world grossly underpaid its frontline troops. While contractors got rich on the homefront, never risking a hair on their precious necks, young Americans fought and died for peanuts. Hasn’t it always been this way? Today, Americans are uncomfortable calling attention to pay discrepancies and exploitation because it smacks of Marxism and class warfare. Yes, some of the worst abuses of workers have been curbed since my Dad suffered through the Great Depression, but today’s workers are simply scared: scared that their jobs will be outsourced, scared that they’ll be “downsized” (i.e., fired); scared that they’ll be replaced by robots. Thus they put up and shut up. For all the rhetoric about the dignity of work in the USA, Dad’s words still ring true: so-called unskilled labor, or demanding physical work, is still undervalued and disrespected in our country. And for all the talk of “supporting our troops,” those young men and women sent into harm’s way are still paid little when you consider they’re risking their necks. Which makes me think of another one of my Dad’s sayings: “the more things change, the more they remain the same.” Especially if we don’t work to change them. Interesting post. In 1967 the salary for a “Buck Private” was about $98 a month! Of course, when the US goes to war–oops, I mean “engages in a police action” or “protects the nation from terrorists,” etc.–the issue is to what ends are the troops being deployed, not how much are they being paid? That is to say, was the deployment justified or ginned-up based on propaganda, half-truths or flat-out lies? In my own lifetime there has been no deployment I can deem justified. I am opposed to the maintenance of a mercenary military, which is what the US now has. Indeed, I am opposed to a society that leaves young women and men with so few employment opportunities that they gravitate to the military as a course of last resort to earn a salary. Secretary of War–oops, I mean Defense–Hagel recently suggested it was time to put the military machine on a diet to lessen the burden on taxpayers. His trial balloon was shot down quicker than an incoming hostile aircraft as war industry lobbyists got on the phone to their creatures in Congress. With Mr. Putin behaving so naughtily I guess “we” will “have to” take the opposite tack–big military buildup!! The Russkies are coming, the Russkies are coming!” “Plus ca change, plus la meme chose” indeed. Who find the cupboard bare? Your father was seven years older than me. We both lived In tough times that Americans today are just beginning to see, They will learn. After 1929 the world economy collapsed because of the destructive policies of the politicians across the industrialized world. Despite the signs that our politicians point to that “things are getting better” they are getting worse. The only difference today from 1929 is that it is a slower slide downhill because of the liberal socio-economic policies instituted during and following WW II. These protections for our citizens are being relentlessly attacked and torn down by the same reactionary forces that created 1929. There is a vast difference between the military of 1942 when your father went in and today’s military and that difference is profound. We had a real reason to protect our country not a phony reason given to protect our corporations and the destructive desire for oil. By 1942 when your father went in and 1943 when I went, there was “total mobilization” of the nation. This was not just “newspeak” but reality. All segments of society and the economy were devoted to the ‘war effort”. Food prices and consumer commodities were rationed to all citizens and prices and wages were fixed by the government. Consumer hard goods (autos, appliances, pots and pans, etc) production stopped. Critical materials ( steel, aluminum, copper, wool, cotton, chemicals, wood, etc) were designated for military production only. Silk went to war and women had to actually paint their legs to appear like they were wearing silk stockings. Manufacturers could only charge the government their cost plus 6%. Was there cheating? Arthur Miller’s play, ALL My SONS showed the price one manufacturer paid for trying to cheat. Yes, your father, a poor boy got $21 a month but so did the bankers son who served next to him because it was truly an egalitarian army. I have a book written by the son of the president of one of the largest shipping companies in the country recounting his experiences as a replacement infantryman shipped into the European theater as a private. ( The Gentle Infantryman). I reconnected at one of my air bases with my old friend, the son of the general superintendent of the Carnegie-Illinois Steel works in Gary who was in the same unit as I. Virtually every house and every block in rich and poor neighborhoods throughout the country had a blue star or a gold star (death) hung in their window because they had a child in the game. Out of a population of approximately 1.25 million, 16 million were in for the duration. Was all of this perfect? Not by a long shot , for African-Americans it certainly was not in the army. For Japanese-Americans it was definitely not. But it was a rare time of national unity with some sense of social justice that does not exist today and certainly does not exist in our once representative government. Your thoughtful article ends with this quote from your father “ the more things change the more they stay the same”. If your father were alive today I think that he would feel as I do that the sacrifice of our youth was in vain because things are not the same, they are much worse now than ever before because our constitution has been shredded and we have become a predator nation feeding on our own people and others. The struggle must be engaged to bring back our rule of law for all. When Eisenhower downsized the military post-Korea (well, technically, post-ceasefire in Korea, since the war never officially ended! ), the time of my own adolescence, there was something of a peace dividend. We got the Interstate Highway System (named for ‘Ike,’ in fact), for one, though I understood its underlying purpose was to facilitate rapid troop movements when World War 3 broke out–I’m not sure how useful it really would’ve been after X number of Russkie H-bombs arrived, though! For several years now, we’ve heard discussion of doing something to shore up our crumbling national infrastructure. An excellent idea, but where is the action? I have major disagreements with NY Times columnist Thomas Friedman, but years ago he floated an idea I stood up and saluted immediately: a national project, propelled by tax money, of Manhattan Project magnitude, to shift from fossil fuels to renewable energy resources. Unsurprisingly, given the stranglehold Big Oil has on us all, that trial balloon sank like lead. A pity, a damned pity. Whatever became of the peace dividend we heard about when the USSR bit the dust in early 1990s? Why, one couldn’t find it with a scanning electron microscope! But the corporations that feed the Pentagon’s hunger for high-tech toys are certainly doing well, aren’t they? The vast majority of US population waved the flag and supported the war effort of 1941-45; they swallowed the “justification” for Korea; they swallowed the need to stop “dominoes from falling” in Southeast Asia–initially, at least. They waved the flag as two Bushes attacked Iraq, then Afghanistan (and Pakistan, Yemen, etc. via drones), though uncomfortable questions arose as the years went by. But yes, I have to agree (though I wasn’t here yet to personally observe) WW 2 was the last time there was a sense of true national unity. Government statistics on unemployment are phony as hell; all but the most naive must accept that. Here in rural New England where I live, heroin use is on a rampage. Bank and convenience store holdups are also epidemic. This is what happens when a society neglects the welfare of the “underclass,” though I’ll bet some of these dope dealers and stickup artists once deemed themselves middle class. “Conservatives” would scream bloody murder about “make-work projects” if something like the old Civilian Conservation Corps was proposed to repair our infrastructure. Lacking a WW 2-type impetus, such proposals would be DOA in Congress, if the Democrat currently in the White House even had the backbone to propose them (he did spew some hot air to that effect some time ago). But the philosophy of “The Magic of the Marketplace will cure all ills” prevails, so we limp along with sustained high unemployment, gross inequity in paychecks, bridges and tunnels in danger of crumbling, a disillusioned and depressed labor force…and zero percent interest rate for the biggest banks! This is a formula for dreck. Ongoing, unmitigated dreck. Will Hillary effect a miracle after her “inevitable” triumph in 2016? Dear Lord, help us!! !